Dessert hummus is now a thing! Well, a thing sold in grocery stores! 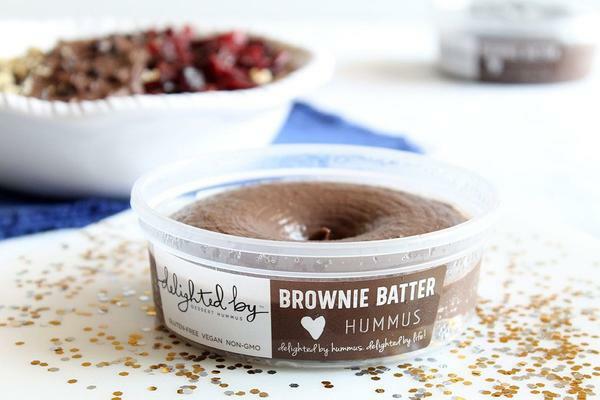 If your inner foodie isn’t on “whip this up on my own” levels you’ll be just as thrilled as we are that a new hummus company has decided to be the pioneers of this healthy dessert alternative. Delighted By, was recently featured on Shark Tank, sparking the interest of a fit friend who then shared the goodness with me. We’re not sweet talking you, there is now a high protein snack available in stores that is actually yummy and allows you to have your cake and eat it too! Even better, the list of ingredients is short and easy to pronounce. So, you get muscle-building protein, satiating fiber, and healthy fats. This is the perfect clean way to twist things up when those sweet cravings start to kick in. This recipe was inspired by our fit friend Kelsie G.(@KayyGood). I love over ripened bananas but for this, you want bananas that are ripe, but still firm. No black spots on the peel. Slice your bananas and set aside. Then add your honey, coconut oil and cinnamon to a nonstick skillet. Add your bananas, cook for a few minutes on each side until they have the rich copper caramelized color. Spread your Brownie Batter Hummus onto your warm toast, add your caramelized bananas on top and garnish as you please. (We added unsweetened coconuts flakes and chia seeds).